Grand Avenue is home to many of the Twin Cities best restaurants and bars. 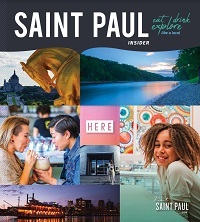 The vast assortment of cuisines and atmospheres on Grand Ave in St. Paul, MN draws in guests from near and far who look for the best that St. Paul and Minneapolis restaurants have to offer. With bars around every corner, visitors to Grand Avenue can experience Minnesota craft brewing like never before. GrandAve.com is happy to bring you a top Twin Cities dining guide, so you can experience everything our wonderful Twin Cities have to offer. Embrace the cold-weather winter wonderland and hit the town for these seasonal events. Celebrate Fourth of July weekend in Minnesota's capital city. Celebrate Father’s Day #MYSAINTPAUL style at these dad-approved spots. Kick off summer in style at Saint Paul’s Grand Old Day, the largest one-day festival in the upper Midwest.